Compute-intensive workflows are the environments in which the newly developed JMR SiloStor NVMe family of SSD drives is designed to show its colors. Ideal for HPC, data centers, genome research, content creation, CGI/animation, codec processing and gaming, among others, the SiloStor drive family comes in three NVMe/PCIe configurations: single-drive module, x4 PCIe connectivity in 512GB/1TB/2TB capacities; dual-drive, x8 connectivity in 1TB/2TB/4TB capacities; and quad-drive module, x8 connectivity, available in 2TB/4TB/8TB capacities. 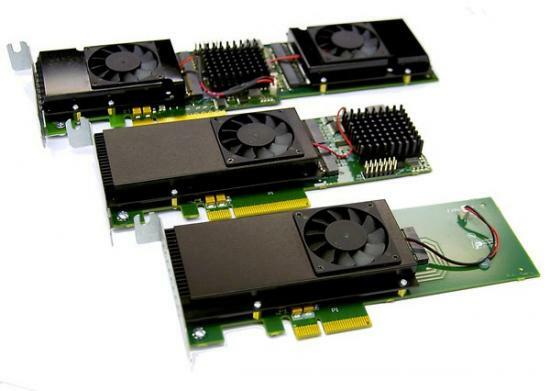 The dual- and quad-drive cards incorporate a PCIe switch, and the drives can be striped (on a single card) for additional performance. All SiloStor designs incorporate active heatsink coolers on the drive modules themselves, maintaining low operating temperatures even during intensive sequential write operations. Key performance metrics include <1 mS average access time of <1 mS, 2 million hours MTBF, 1,200 TBW minimum endurance, 90,000/70,000 IOPS random 4K read/write speed and 4,000/3,000 MB/sequential read/write speed.